Over 300 people set up chairs and blankets at Reaume Park on Sunday night for a free concert in the park performed by the Silver Ambassadors. The “Swingin’ Summertime” season finale included medleys of cartoon classics, swing, Beatles, Beach Boys and Latin tunes. Throughout the one hour show visitors came and went while children danced and spectators tapped their feet and sang along. The concert ended with the entire crowd standing to sing the American and Canadian national anthems in celebration of the holiday. 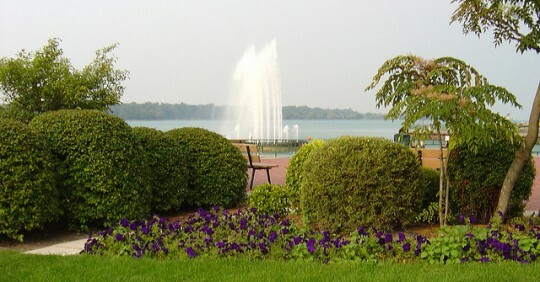 Next Sunday, July 11, 2010 at 7pm, the Greater Windsor Concert Band kicks off their summer season in the same location. Bring your chair or blanket to Reaume Park (Riverside Drive East at Pillette) and enjoy a great evening show. Pack a cooler or enjoy treats from the nearby refreshment stand. Parking is limited so be sure to car pool or ride your bike (please note: bikes may not be ridden inside of the park itself and dogs are not allowed). Sounds like it was a great event, thanks Victoria! Check out next week’s event!